Home » Communications » Welcome to Samantha Zuniga Thompson, LCSW-S, our new Program Specialist! 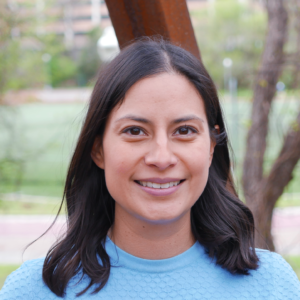 Welcome to Samantha Zuniga Thompson, LCSW-S, our new Program Specialist! We recently sat down with Samantha Zuniga Thompson LCSW-S, our newest staff member, to learn a little bit more about her! Samantha is our Program Specialist for the Texas Permanency Outcomes Project. Her professional passion and experience revolves around developing programs and interventions that foster a parent’s ability to parent in a safe and nurturing manner with the overall goal of creating healthy and thriving families. She has 15 years of experience providing therapeutic support services to children and families who have experienced abuse, neglect and trauma. We are so happy to have her join us! To learn more about Samantha, please visit her staff profile. What excites you or interests you most about the work you do? That I can continue to have an impact on practices and policies that promote healthy families. I am excited to be on a project that promotes permanency for children and families. Do you have a past job or any previous work you want to highlight? I was previously the Clinical Supervisor at The Center for Child Protection. I provided clinical oversight and supervision for a team of clinicians providing long-term services to children and caregivers involved in the child welfare system or who had a confirmed case of child abuse. What is something you hope to achieve in your career? I’d love to teach a course at the School of Social Work one day. What are some of your personal hobbies? I enjoy spending time with my family outdoors, we love to go hiking, camping and just be outside. I also enjoy yoga and reading a good book (non social work) when I can. I was born and raised in Austin and I’m a first-generation college student. I participated in a program in my youth called the Hispanic Mother Daughter program, the program’s goal was to empower Hispanic girls to attend college. The program was through the UT SSW, I think is kind of cool that I ended up back here.